Let’s quickly scroll through the last two days before that, though! 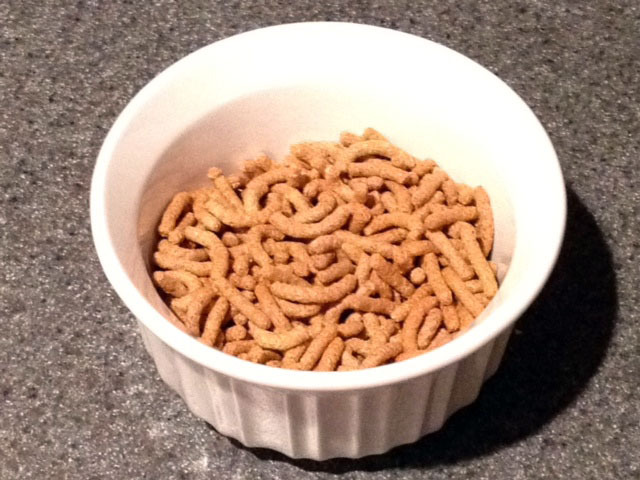 …some Fiber One Original Bran cereal. 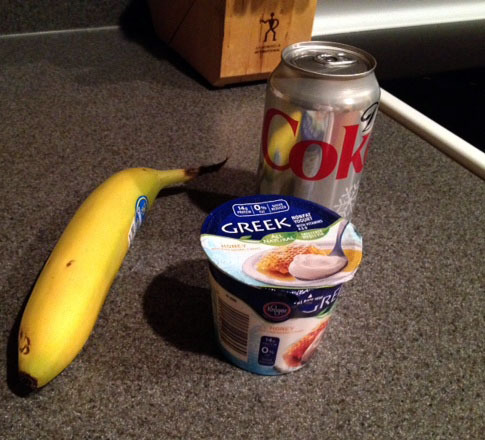 On this particular morning, I was rushing out of the house and forgot to snap a picture of my lunch. Sorry! 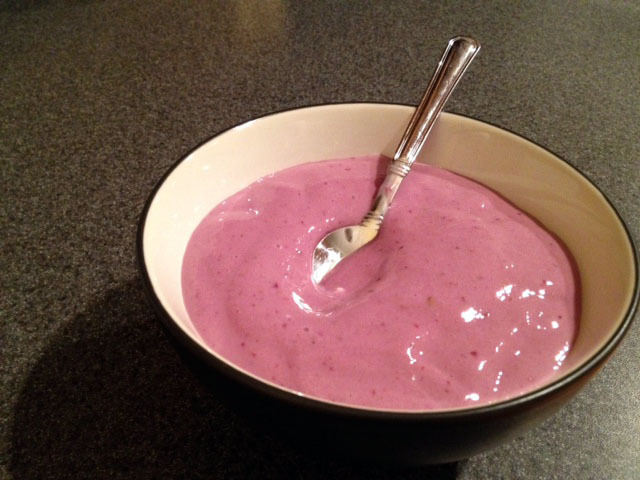 However, I had a cup of blackberries, 3 oz. baby carrots, a pack of chunk white tuna, about a quarter of a whole-wheat pita pocket (it was quite stale… oops), and a few Sour Patch Watermelon candies. This was the “official” start of the second semester (weird that it starts the day after the first day following break), so we had a couple of new members on the school newspaper to introduce. That was fun, since we got to talk about what we do as a staff. I absolutely adore being a part of the paper, so I naturally love talking about it. 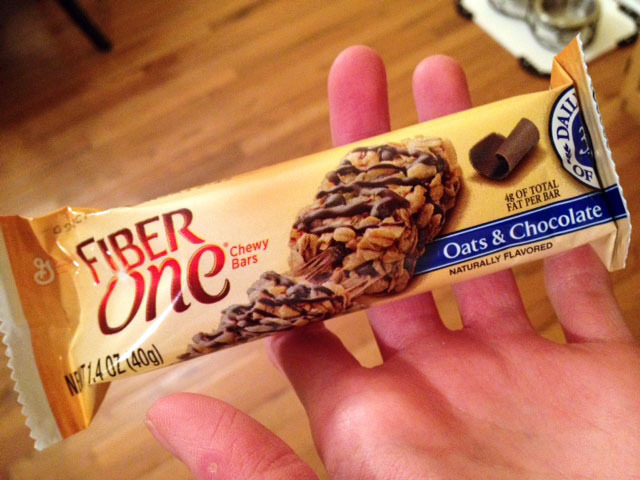 When I got home, I had my second dose of Fiber One, and then I worked, worked, worked on homework. Unfortunately, this took me right up until dinner. We planned to have steak, but none of us were really feeling it, and I was feeling crappy. 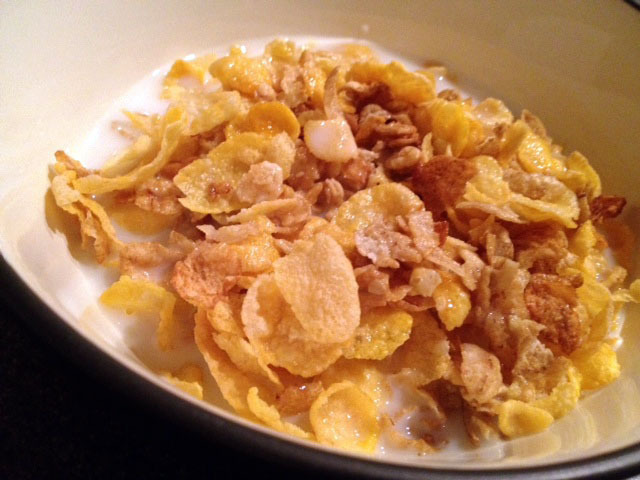 So, cereal-for-dinner happened. Oh, well! I had about a 1.5 cups of Honey Bunches of Oats and .75 cups of 1% milk. It had been quite a while since I’d had it, and it so hit the spot. I know that cereal isn’t an ideal dinner, but I also know that “well-rounded” is a most of the time requirement. Sometimes, that goes out the window, and that’s totally okay. Sometimes, it just feels better! 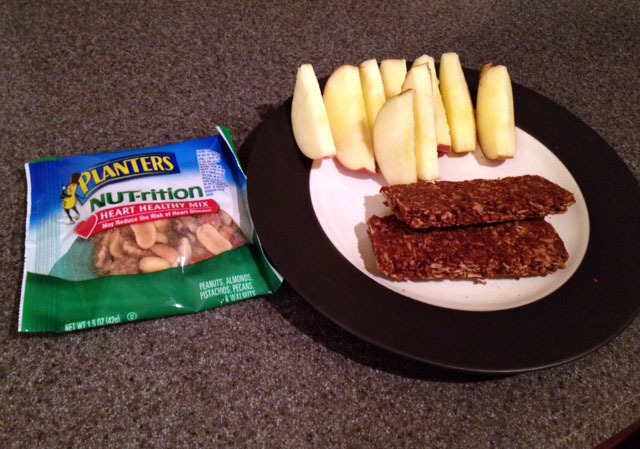 … composed of a Planters Heart Healthy Mix NUTrition pack, a large Braeburn apple, and a pack of Oats ‘n’ Dark Chocolate Nature Valley crunchy granola bars. And off to bed I went! 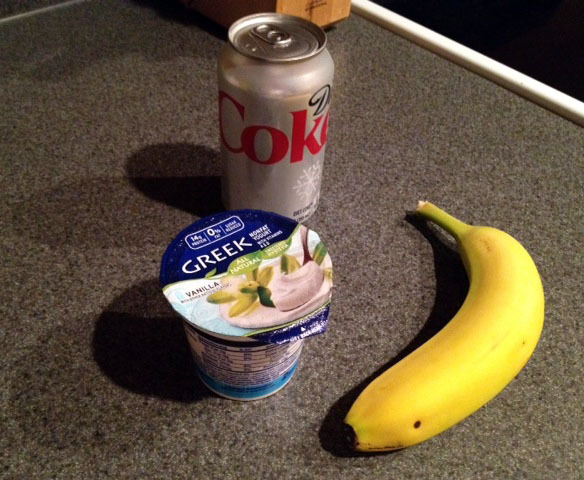 … my breakfast of champions! I had some Fiber One after that. 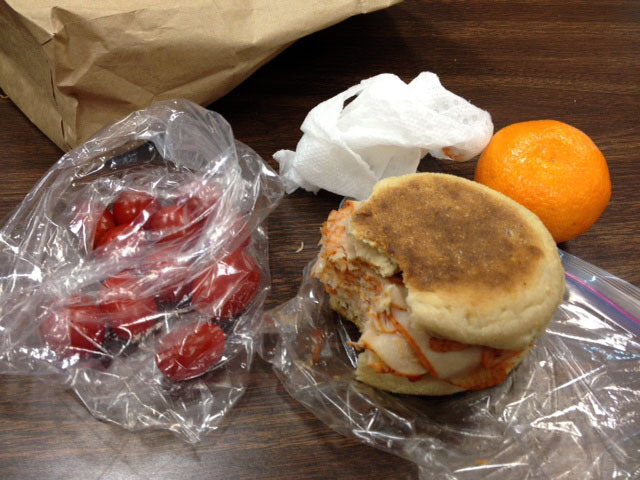 … a handful of cherry tomatoes, a clementine, and a sandwich made with 5 oz. Dietz & Watson Santa Fe Turkey and an Aunt Millie’s Multi-Whole Grain English muffin. It was really quite tasty. Hm, maybe I should do that more often! I had zero homework/studying to do last night, so I mostly rested and read. I had a couple of pieces of Sour Patch Watermelon candy after school, along with a Twizzler, and a Dove milk chocolate snowflake. 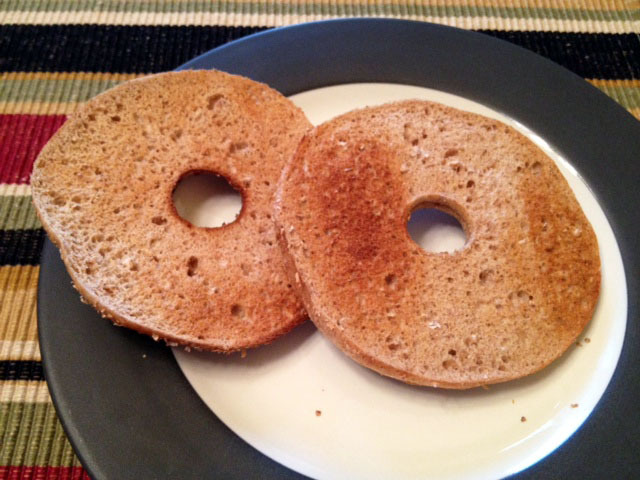 These little snacks were followed by my second serving of Fiber One cereal and a 100% whole-wheat Bagel Thin. Dinner was what we planned on having the night before – steak! We had grilled top sirloin steak with onions sauteed with garlic and Kraft Sun-Dried Tomato vinaigrette and topped with Parmesan cheese. 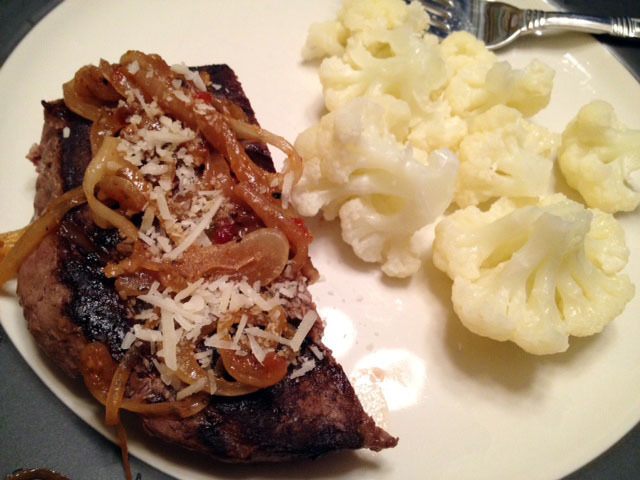 (The recipe is this one, from Kraft: http://www.kraftrecipes.com/recipes/garlic-steak-onions-107312.aspx). We replaced the steamed broccoli with steamed cauliflower topped with a little unsalted butter. 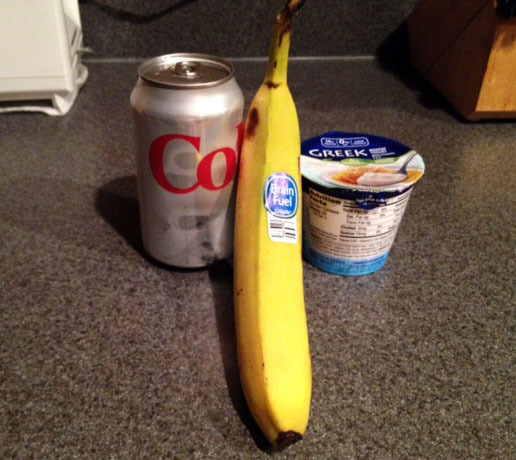 It was quite the tasty meal – and it was easy! 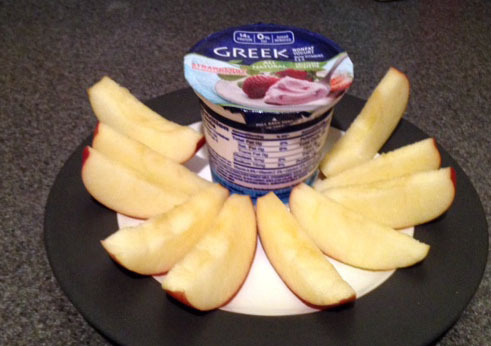 … and a Braeburn apple with strawberry Greek yogurt second! And it was off to bed with me! I had the same old stuff for breakfast. And Fiber One for my morning snack. I was honestly kind of nervous going to school today, because I received a note yesterday, saying that the principal had requested a meeting with me. Okay. I did nothing wrong. But then some other members of Class Cabinet said they had gotten those notes, too. That made me feel better – until I realized that mine was at a different time. I could only think that maybe there was a separate meeting for the president. Still, though, I had no idea what the meeting was going to be about. It wasn’t bad at all! All of the cabinets had been summoned, and my meeting was just for the presidents. We were asked to be part of a decision-making process. That was really cool, to be blunt. I knew when I joined the cabinet that I would be in a leadership group, and I knew that our main goal was making money for our future prom. I didn’t realize we would get to help organize a policy that would be implemented in the school for the future. Granted, we probably don’t have too much say in whether this policy is put into action. We do, however, get a little say in how it works. And that’s kind of awesome. After the meeting, though, I had a really bad headache. So, I asked my mom to come pick me up. She had intended to go to Chipotle for lunch, and I wasn’t arguing. We just picked it up and came back home so I could rest. 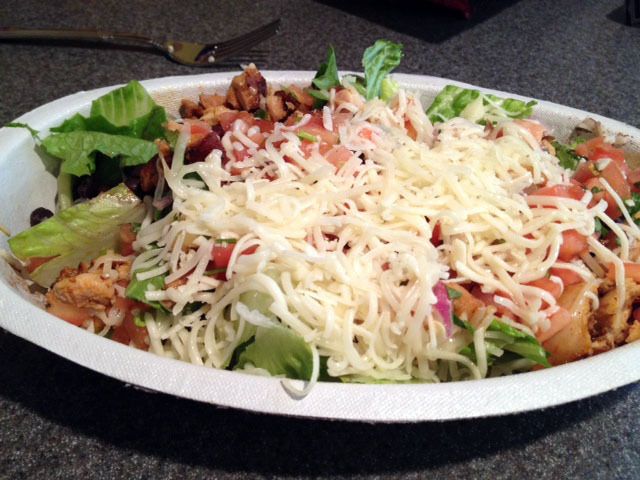 My bowl contained Romaine lettuce, chicken, black beans, fresh tomato salsa, and cheese. Great deliciousness, it was. I did a little work throughout the afternoon, slept a tiny bit, ate some more Fiber One, and then we headed out to dinner. As I said, today was my uncle’s 21st birthday. And Gordon Biersch was in order. My parents and I met up with my grandparents, Kyle, and Kyle’s girlfriend, Anastasia, at the restaurant. 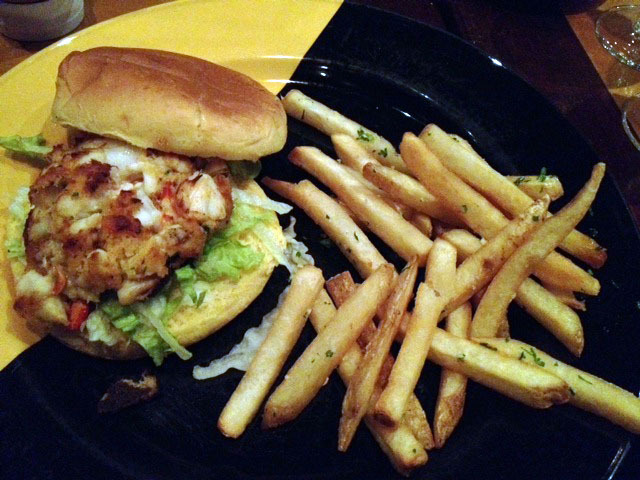 … my Lobster & Crab Cake Sandwich. With GARLIC FRIES. Well, the fries weren’t actually that great. But the sandwich was incredible. I could eat it forever. Probably not, actually, but it was really good. I only ate about half of the fries with a little dab of ketchup. Not a huge ketchup person, but I use a little with fries only. I am absolutely exhausted, and I plan to go to yoga tomorrow morning. So, I’m going to hit the hay. Good night!